Should I Get a Drop Safe? Companies have been using drop safes for years to ensure their monies and investments are protected. The unique feature of a drop safe is that anyone can place things into it but only the person with the key can take them out. Many large corporations use this style of safe to make sure cash registers are not overloaded with cash throughout the day. In large scale companies, the employees or the managers go to each drawer at regular intervals and collects the cash in the register. Then the collector places the cash in drop bags to place in the drop safe. This is extremely effective in grocery stores, department stores and even fast food locations. This is why you see signs saying the register only has $50- $100 in it at anytime. Drop safes make your employees feel more comfortable that they will not be robbed. If you have a retail business, you should have a drop safe. It protects your business as much as your employees. Have you ever watched the news and watched a story about a person who went to jail for robbing the corner store for $120 or $75 or just a small amount of money? Those corner stores did more business than that that day, but because of a drop safe there was only a small amount of cash in the drawer. Even if the guy did get away with the money, it’s not a huge loss on your end. Drop safes come in many designs and sizes. We have many drop safes for everyday use. Make sure you are choosing a safe large enough for your business to operate daily but small enough to fit into the space you plan on placing it. Drop safes are a smart decision for any company, big or small. Check out our inventory today! No business owners want to really think about the chances of a robbery, and they definitely do not want to consider the problem of employee theft, but these things do happen. A great way to reduce your danger, and increase the safety of both your money and your employees, is to invest in a drop safe. A drop safe is a small safe that can easily be placed under your registers, so that employees can quickly and discreetly secure money once the balance in their register becomes dangerously high. These safes are especially useful to have if your business sees a large amount of cash flow throughout the day. You business, and your employees, will be much safer if there are not extremely large sums of cash in their tills. These secure containers have an opening just large enough for the employee to slip funds into, but no items can easily be taken back out. You might be thinking that thieves would simply bring devices to fish the money out of the openings, but drop safe brands such as Protex, Hollon, and Mutual, are equipped with a baffled edge that stops this from happening. The inside of the opening looks a bit like layers of sharks teeth, which makes it impossible to fish the funds out of the safe once they are deposited. Drop safes are extremely secure devices, perfect for protecting large sums of money throughout the business day, but if you want to protect your cash overnight, you should consider investing in a larger depository safe. 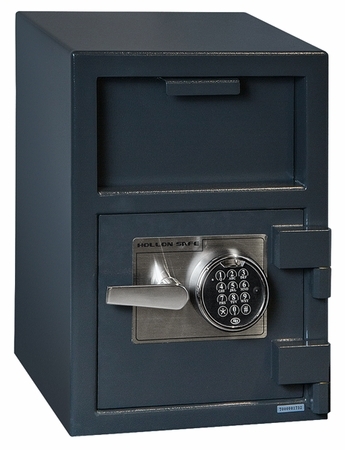 These safes are similar to the drop safes, but are reinforced with a drill resistant hard plate, and provide the maximum amount of protection to keep your money safe even overnight. Regardless of how much you trust your employees, or feel safe in your community, you should certainly have at least one of these two kinds of safes to make sure your hard earned profits are protected. Too many business owners wait until after a substantial amount of their cash is stolen before they think of building up their safety precautions. It is much wiser to go ahead and secure your money, rather than wait to do so in the wake of an incident. You can give you, and your staff, a great peace of mind by simply installing a drop safe and removing the potential for danger. Small businesses that deal with a lot of cash on a daily basis can always benefit from the use of a depository safe. Hollon makes a great safe that can protect your assets throughout the day and night until you are ready to take your earnings to the bank. These safes have drop depositories that are protected by “shark teeth,” which discourage thieves from fishing any cash out after it has been deposited. After using the safe for only a short time, you will be thrilled at how balanced your books will be without the threat of theft or misplacement of cash.